How many days until Christmas … Is it really ever too early to start working on your list? 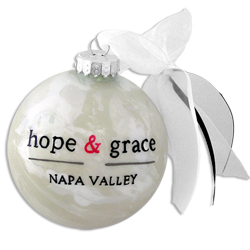 This beautiful hope & grace glass Christmas ornament is hand-painted here in the USA. It is the perfect little keepsake of the wine country … Either for yourself to commemorate your Napa Valley holiday, or that perfectly selected gift for the special someone who needs a little hope & grace in their life. We would love to wrap this up in a pretty box with a bow … just let us know where to ship this special gift!